Any Ideas for Dinner? : duck! Every time I take a trip to Atlanta, I like to stop at the Dekalb Farmer's Market. There's so many different interesting foods here, it's a bit overwhelming. Heck, the produce section is as large as some smaller grocery stores I've been to. Among the things I picked up on this trip (see future posts...) were duck breasts. 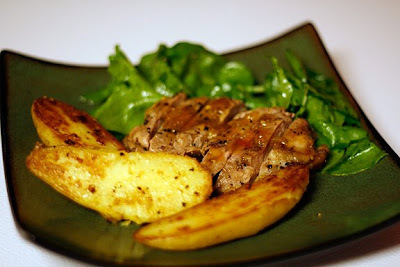 Having never cooked duck before, I adapted a couple recipes from Emeril for seared duck breasts, fingerling potatoes, and an orange-apricot sauce. 1. 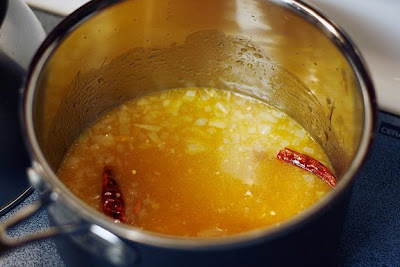 Start the glaze by heating the oil in a small pot, then adding the onion and garlic. After browning slightly, deglaze with the orange juice and vinegar. Add the red chile pepper. Start reducing, then add the apricot preserves a bit later. Let this reduce over medium heat for while you prepare everything else. 2. Put the potatoes, whole, into a large pot and cover with salted water. Put over high heat while you prepare the duck. 3. Heat an oven-safe skillet over medium heat. Score the skin side of the duck breast in a crosshatch pattern with a sharp knife. Salt and pepper on both sides. Place skin side down on the skillet and cook for about 12 minutes. This will render the fat make the skin crispy. 4. 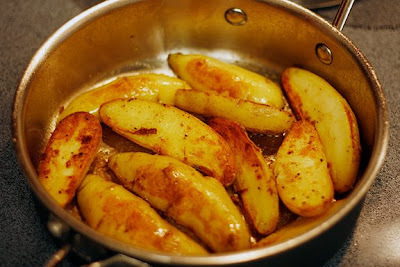 After the potatoes have boiled for about 7-10 minutes, take them out and rinse them with cold water. Cut in halves or quarters lengthwise (think fat fries) and season with salt and pepper. 5. 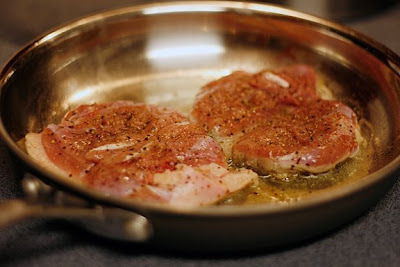 After the duck is done in the skillet, save approximately 2 Tbsp. of the rendered fat for the potatoes, then move the duck into a 400F oven for 10 minutes. 6. Heat the reserved duck fat in a skillet, then place the potatoes cut side down. Cook for about 4 minutes or so, until they turn brown and crispy. Flip and cook for another 4 minutes on the back side. 7. Toss the arugula with a little bit of oil and vinegar and a bit of salt and pepper. Let the duck breast rest for a bit, then slice and serve over the arugula. A spoonful of orange-apricot glaze over the top, some potatoes on the side, and you're ready to eat. I have never considered making duck at home but now I'll have to do some research.